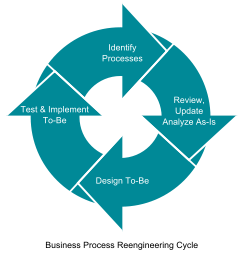 Business process reengineering is a business management strategy, originally pioneered in the early 1990s, focusing on the analysis and design of workflows and business processes within an organization. BPR aimed to help organizations fundamentally rethink how they do their work in order to dramatically improve customer service, cut operational costs, and become world-class competitors. Thomas H. Davenport, "Need radical innovation and continuous improvement? Integrate process reengineering and TQM." Planning Review 21.3 (1993): 6-12. To succeed at reengineering, you have to be a missionary, a motivator, and a leg breaker. Michael Hammer in: Fortune, August 1993. Quoted in: QFINANCE: The Ultimate Resource, 4th edition. Bloomsbury Publishing - 2013. Reengineering posits a radical new principle: that the design of work must be based not on hierarchical management and the specialization of labor but on end-to-end processes and the creation of value for the customer. Reengineering is the fundamental rethinking and radical redesign of business processes to achieve dramatic improvements in critical contemporary measures of performance such as cost, quality, service and speed. Business Process Reengineering seeks radical rather than merely continuous improvement. It escalates the efforts of JIT and TQM to make process orientation a strategic tool and a core competence of the organization. BPR concentrates on core business processes, and uses the specific techniques within the JIT and TQM "toolboxes" as enablers, while broadening the process vision. Henry J. Johansson Business process reengineering: Breakpoint strategies for market dominance. John Wiley & Sons, 1993. Over the past decade, I have watched more than 100 companies try to remake themselves into significantly better competitors. They have included large organizations (Ford) and small ones (Landmark Communications), companies based in the United States (General Motors) and elsewhere (British Airways), corporations that were on their knees (Eastern Airlines), and companies that were earning good money ((Bristol-Myers Squibb). Their efforts have gone under many banners: total quality management, reengineering, right-sizing, restructuring, cultural change, and turnarounds. But, in almost every case, the basic goal has been the same: to make fundamental changes in how business is conducted in order to help cope with a new, more challenging market environment. August-Wilhelm Scheer, ARIS architecture and reference models for business process management (2000), p. 379. This page was last edited on 31 August 2016, at 01:03.